Described by Mr Robertson of the Nightingale herd as the best bull he has ever produced in over 40years of breeding. Perry is a bull with fantastic pedigree, truly one of a kind. 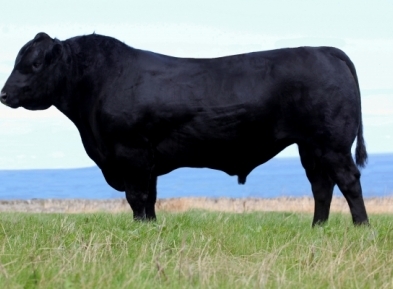 He stems from the famous "Pride of Pershore" line that has bred generations of phenomenal cattle such as Netherallan Peter Pershore who has bred sons up to 25,000gns. Perry's sire is the famous Nightingale Ploughman who was sold to genus and has been used throughout the UK. Also wrapped up in Perry's pedigree is Nightingale Precious Princess A051, described as the best cow at Nightingale. Perryvale Roscoe and Perryville Mancini also are in Perry's pedigree which will compliment the daughter off Bosullow Blackman who also contains these influencial sires. Perry isnt all tremendous pedigree, he is also figures. He has a phenomenal carcase attributes and will add superior muscling to the females and bulls produced at the Borewell herd. Because of his tremendous pedigree and figures this has earned him TOP figures. He is not a "One shot wonder" his dam line proves consistant improvement for generations. His Dam line stems back to the great Pride Pershore S44 cow and from her there has been consistancy and improvement. The figures say it all! S44 is 35 TSI and Perry ranks a huge 51 TSI this shows consistancy AND improvement! A bull to breed. Females and Bulls.